Milwaukee<sup></sup> M12 Realtree Xtra<sup></sup> Camo 3-in-1 Heated Jacket: The first customizable heated jacket system designed for the outdoorsman, the Milwaukee<sup></sup> M12 Cordless Realtree Xtra<sup></sup> Camo 3-in-1 Heated Jacket sets a new standard in cold-weather performance and versatility. Worn separately as a base layer or attached to the outer shell and zip-off hood, the heated vest integrates (5) carbon fiber heating elements and advanced fabric-layering technology to distribute and maintain heat across core body areas. The rugged wind and water resistant shell features special noise-reducing fabric with the Realtree Xtra<sup></sup> Camo pattern. Made out of the same weather-resistant material, a removable hood helps keep heat in and provides additional protection against the elements when added to the shell. Powered by M12 REDLITHIUM Batteries, It also includes a fuel gauge to check your battery life and built-in USB port for charging portable electronic devices. All pieces are washer and dryer safe. 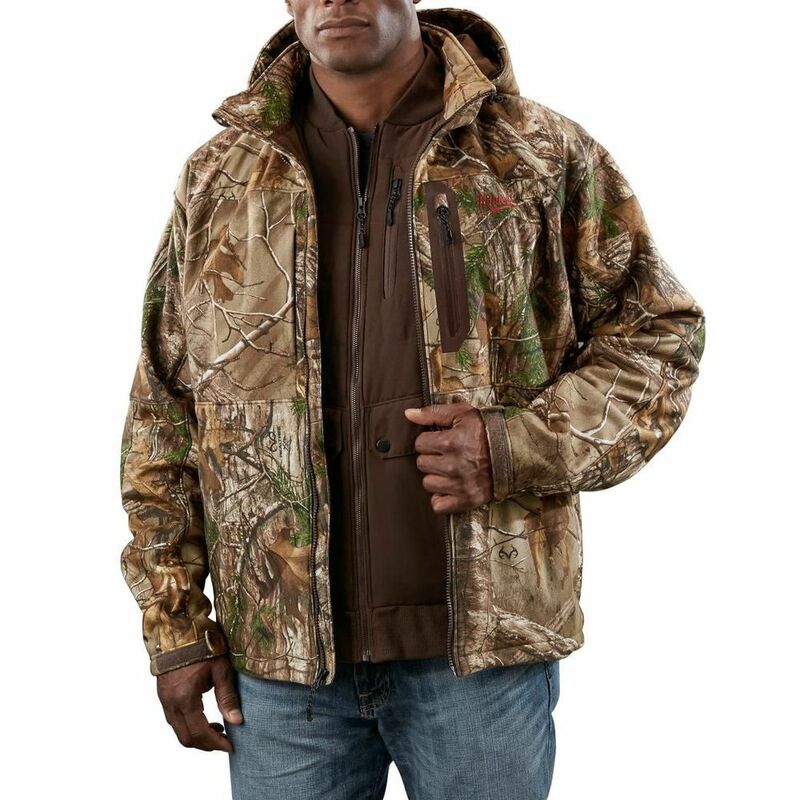 M12 Cordless Realtree Xtra Camo 3-in-1 Heated Jacket Only - 2X Milwaukee<sup></sup> M12 Realtree Xtra<sup></sup> Camo 3-in-1 Heated Jacket: The first customizable heated jacket system designed for the outdoorsman, the Milwaukee<sup></sup> M12 Cordless Realtree Xtra<sup></sup> Camo 3-in-1 Heated Jacket sets a new standard in cold-weather performance and versatility. Worn separately as a base layer or attached to the outer shell and zip-off hood, the heated vest integrates (5) carbon fiber heating elements and advanced fabric-layering technology to distribute and maintain heat across core body areas. The rugged wind and water resistant shell features special noise-reducing fabric with the Realtree Xtra<sup></sup> Camo pattern. Made out of the same weather-resistant material, a removable hood helps keep heat in and provides additional protection against the elements when added to the shell. Powered by M12 REDLITHIUM Batteries, It also includes a fuel gauge to check your battery life and built-in USB port for charging portable electronic devices. All pieces are washer and dryer safe.